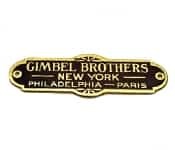 Gimbel Brothers (Gimbels) was an iconic major American department store corporation from 1887 through the late 20th century. The name is often misspelled with an apostrophe. The store is known for creating the Gimbels Thanksgiving Day Parade, the oldest parade in the country. Gimbels was also once the largest department store chain in the country. By the time of its closure in 1987, Gimbel had 36 stores throughout the United States.